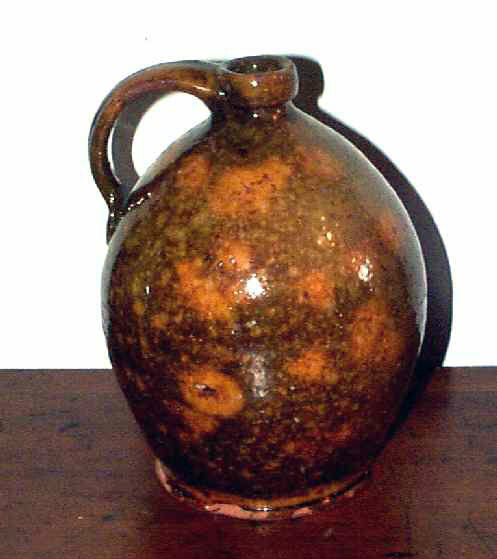 This fabulous Ovoid Redware Jug is a real knockout. The glaze is absolutely outrageous! Glazes of this sort were often caused by impurities in the red clay that produced charming and doubtless unexpected colorings when the pottery was burned. Mottlings and streakings of orange, green, brown, peach and red made pleasing variations on the surface of the ware, adding to its decorative quality. Irregularities in the temperature of the kiln during burning also caused similar changes of color. Without a doubt the potter was familiar with the way the clay dug from a certain area would react in the kiln and so this became the decoration . . . random, yet wonderful. The Jug stands 7-1/2" tall and is in very good condition. There are a couple of in the making imperfections . . . a glaze skip, a tiny "pop", and a "kiln kiss" where another piece was placed too close in the kiln and left a small deposit on the jug. There are also a couple of flakes on the bottom, unglazed part that come with age and use and due to the porosity and brittleness of the Redware body and are considered to be "normal" wear. Look past these little imperfections, appreciate the jug for the beauty of the glaze, the symmetry of the shape, and vitality it possesses. It is a super example of early Redware, dating to around 1800 and is as beautiful today, 200 years later, as the day it was made . . . A fine example of the work of the colonial "folk" artisan.